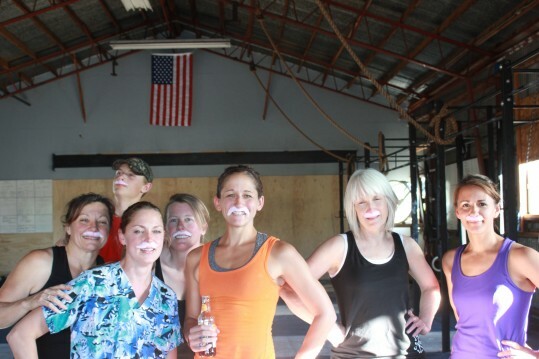 Heather brought in some pink mustachios for Katy’s Birthday, and you all seemed to enjoy them! I have had a lot of you ask me about getting grass fed beef again. Time to pony up and put your money where your mouth is. I can get us 800+ pounds by the end of the week. The price will be between $5.50 to$6.50 per pound, we’ll know more once the cow is all packaged, it will be the same price for all different cuts. Please let me know ASAP how much you would like to buy. Not sure when we’ll be coming across this amount again till next year. 40 lbs for me. I will be there for the workout on the 8th and can hang out for a few, but have family obligations later that day. On another note I did my first ever bar muscle up today. I was happy and bummed at the same time, because I did 18 out the 21 required. Just couldn’t get those last 3. Next time. Think I want 30lbs and am in for the 8th as well. I got Lost Coast envy! Looks like another day of the “functional” part of functional fitness. Something got into the chick’s enclosure – RIP Cottontail! – so we’re rebuilding it today. Hope to see you before we head south. FireSteve, we’re going to get you to socialize with us eventually! Cottontail, hope it was swift. I’d be in for at least 10lbs. So I wrote 50lbs of meat on the board, but its going to be 160 now. When are you getting it?